Around a century ago, there were roughly half a million painted dogs in Africa. Today the species has been decimated — and entirely wiped out in two-thirds of the countries it used to call home. We’ve been working to protect the local painted dog population here in Zimbabwe for over two decades. There are a few key ways in which we try to conserve and protect the species. The first three female scouts of our Anti-Poaching Unit team. L to R: Debra Maphosa first volunteered with the Mabale Volunteer APU in 2014 then joined PDC in January 2017, Belinda Ncube joined PDC in 2017 and Simisiwe Ngwenya also volunteered to undertake anti poaching work with the Mabale Volunteers in 2014 then joined PDC in 2017. Snares used for poaching are one of the key threats facing the painted dogs today. Zimbabwe's economy has been struggling and this has increased illegal hunting of wildlife to sell for profit as bushmeat. This impacts many species, but the painted dogs are particularly vulnerable because they cover relatively huge distances each day compared to most species and consequently encounter many more snares. To combat this, we employ scouts (both male and female) in our Anti-Poaching Unit. These highly trained scouts work closely with the Zimbabwe Parks & Wildlife Management Authority and Forestry Commission patrolling areas bordering Hwange National Park on a daily basis. Since 2001, we’ve collected more than 30,000 snares—enough to kill roughly 3,000 animals—and have managed to keep poaching within the area under reasonable control. 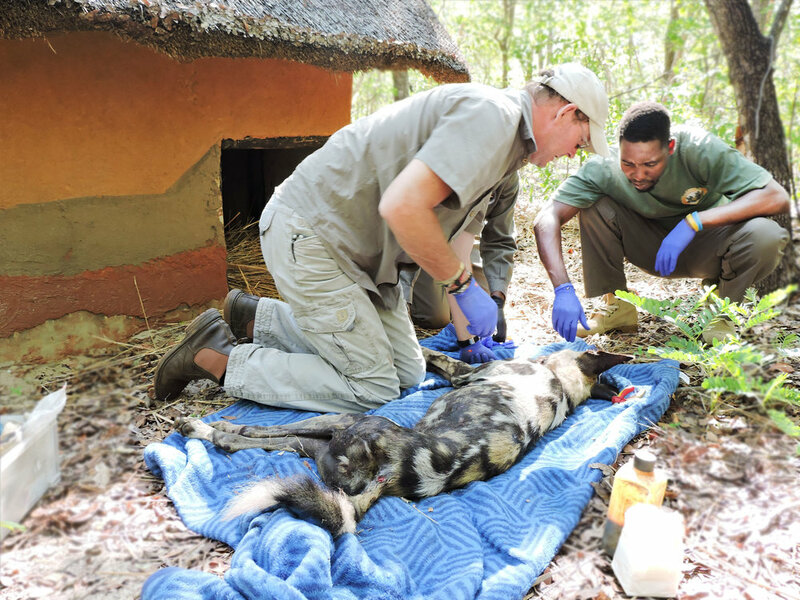 Peter and Geshem attending to a sick painted dog in one of the enclousures at the Rehabilitation Facility. In 2002, we opened the PDC Rehabilitation Facility. This facility has eight different enclosures plus a veterinary clinic and allows us to house and care for injured, sick or orphaned painted dogs with minimal handling until they recover enough to rejoin their families in the wild. We also use the facility to house painted dog packs that are at risk from hostile landowners and other threats, keeping them safe while we find them a new permanent home elsewhere in Zimbabwe. Using the Rehabilitation Facility we keep painted dog numbers up, ensure the safety of threatened packs and educate the public via organised visits to try to improve perception of the painted dogs. Out and about in search of the painted dogs! A deep understanding of the painted dogs underpins everything we do. To this end we monitor painted dog packs using state-of-the-art radio collars to track their behaviour and hunting patterns, identify any causes of injury or death, and keep a close eye on packs we deem particularly vulnerable or in unsafe areas. This data is compiled into a digital identity register for our painted dogs—complete with photo IDs—that locals, tourists, and members of the public have helped us to build and expand. We take samples of blood, faeces, and tissue for DNA analysis and to screen for infectious diseases or parasites, and use the results to develop future management plans. Painted dogs breed at the coldest time of the year. After 69-72 days of gestation, the female pack leader, also known as the alpha female, gives birth to her pups.